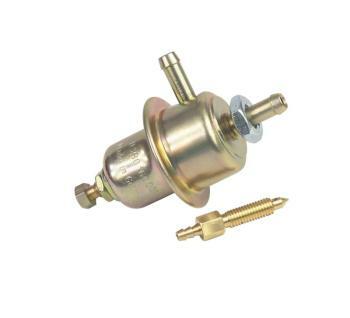 MSD Fuel Pressure Regulator UNIVERSAL - Dezod Motorsports Inc - Home of the automotive performance enthusiast since 2002. Maintaining accurate fuel system pressure on any multiport EFI system is crucial to performance. MSD’s Adjustable Fuel Pressure Regulators allow you to fine tune the fuel pressure to meet the demands of your engine and injection system. Both Regulators are adjustable from 36-45 psi with a flow rate of 9.2-10.5 gal/hr. The inlet and outlets are 5/16” and a jam nut is supplied for special threads on the bottom to ease mounting to a bracket. These rugged Regulators are free standing so they don’t have to be mounted directly to a fuel rail and can be installed in any position. Fuel pressure is set with an adjusting bolt and is locked in position with a locking nut.